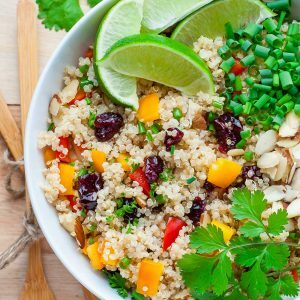 This tasty Cranberry Cilantro Quinoa Salad is super healthy, full of flavor, and ready in just 15 minutes! I mean, that’s what I originally thought about the pairing. Yet here I sit with a giant bowl full of cranberry cilantro quinoa-y goodness, loving every bite. The first thought I had was to tear through my dogeared, spaghetti-sauce splattered copy of The Flavor Bible and search for a connection between the two. Sadly there was none, but if orange juice and fig were suggested pairings for this gorgeous green herb, then gosh darn it, I’m going there! spoiler alert: I went there and it’s AWESOME! As a bonus this deliciously healthy salad is ready in 15 minutes. It’s also make-ahead friendly, portable vegan, gluten-free, paleo, vegetarian, and basically ALLTHETHINGS! Well played, salad. Well played! Next add your water or broth, set burner to high, and bring to a boil. While the quinoa cooks, chop and prep the remaining ingredients. 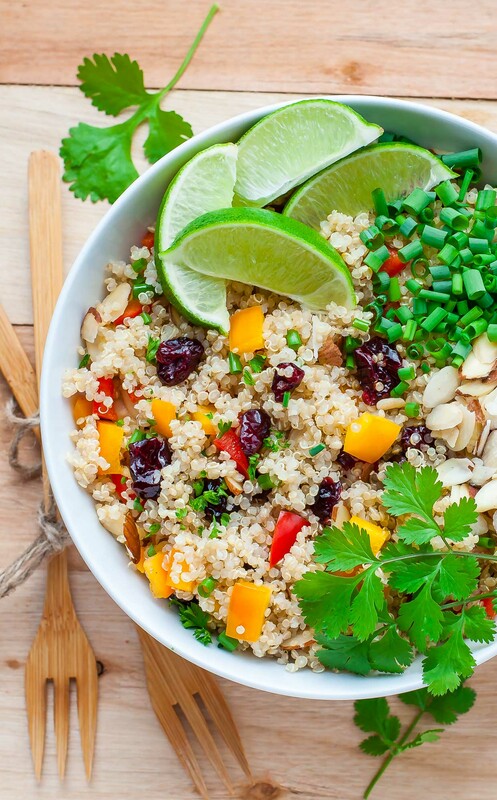 Combine freshly cooked quinoa with lime juice, curry powder, cumin, peppers, onion, almonds, pepitas, and carrots. Season to taste and stir to combine. For best results, chill salad before serving, to allow the flavors to mingle even further! Salad can be made in advance and keeps up to 4 days. Serve with fresh lime wedges for an extra burst of citrus! I originally thought I was out of carrots (the horror!) so the photo doesn't have any orange beauties peeking out from the quinoa. Luckily I found a bag hiding under the lettuce (huzzah!!!) and was able to add them in. I couldn't imagine the salad without them, the flavor really shines through and pairs so well with the rest of the ingredients! I'm in love! The salad is on the drier side (ideal for fluffy quinoa-based salads) but feel free to add extra lime juice and olive oil as desired! You can even serve this dish as a base for your favorite baked or grilled protein. Chicken, tofu, or fish are all fantastic with a little quinoa salad action! Craving a kick? try it with a drizzle or two of Sriracha! It's AMAZING! Delicious! One of my absolute favorite things about this recipe is that it can be made using ingredients I almost always have on hand. The recipe combines a few of our go-to veggies with pantry staples and goodies from my mini herb garden. How easy is that!? I have a feeling this healthy side dish will be making quite a few repeat appearances around here! Though you can certainly enjoy it at room temperature, I’m obsessed with eating this one chilled! I actually tapped into the leftovers and may or may not be shoveling them into my face while I type up this post. Did I mention it’s fabulous topped with Sriracha? SOOOOO GOOD! This sassy side pairs great with baked/grilled chicken, salmon, or pan-fried tofu! 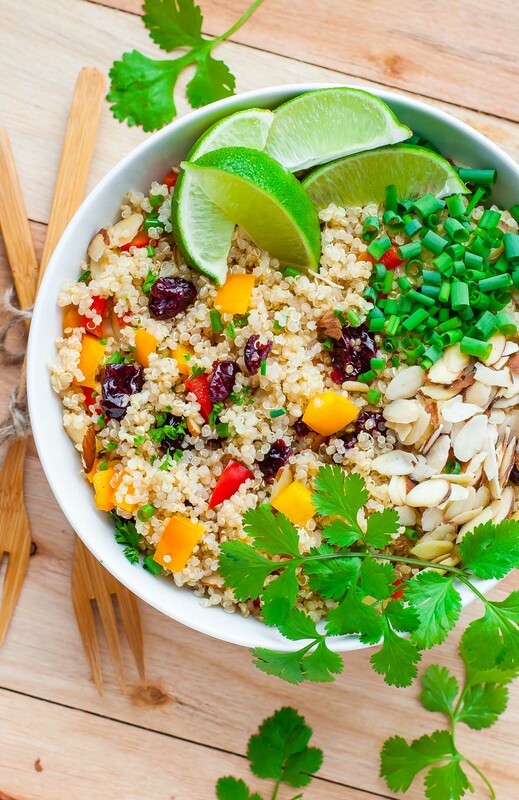 If you get a chance to try this cranberry cilantro quinoa salad recipe, let me know! Leave some love in the comment form below or tag your photos with @peasandcrayons on Instagram so I can happy dance over your creation! I can’t wait to see what you whip up! Just to confirm… You add water to the quinoa before the water is boiled? So the water warms up with the quinoa already in it? Delicious recipe! We place it on our best recipe to RE-DO! With the toasted nuts? Damn! Thank you for sharing! So glad y’all enjoyed it and that it made re-do status! Yay! Thanks Dominique! Was borderline worried half way making this as i was putting the combination of ingredients in but it turned out SOOO GOOD! Definitely a staple salad now! Thank you!! P.s. loved the tip about toasting the quinoa before cooking it. Made it much nicer. So so happy to hear you loved it Sophie; thank you! Simply Delicious!!!!! The flavours compliment each other so well! This dish is so light tasting, but it is filling when you need to grab a quick snack. I added a tad bit more cilantro (because i can never get enough) and I added the smallest pinch of ground cayenne pepper which gave it a nice little kick! My whole family enjoyed this dish, and we will continue making this! It was my first attempt at making a homemade quinoa salad (I usually get the really delicious Costco one), and I must say, I don’t think I’ll go back to store-bought! I’m a changed woman! Thanks so much for the recipe! I was so excited about this recipe! So many things I love: Cilantro, cumin, lime, cranberries, quinoa! Yum! As a Texas girl, I am familiar with these ingredients and I knew curry powder didn’t fit. I reluctantly tried it and still have the same conclusion. I will make it again without the curry, though! The other ingredients together are brilliant! Thanks for the inspiration! Anything that takes 15 minutes or less to prepare is on my list of must-try recipes. Plus, our family loves quinoa and almonds. So colorful! This is the epitome of feel good eats. What a great winter salad with the cranberries! I love quinoa! This looks fantastic! What a beautiful and healthy combination of ingredients! Love the bright colors here. I bet it’s just as flavorful! Sounds like a great combination of flavors to me!! Cranberries and cilantro sound like an AWESOME combination. You know sometimes the craziest sounding ingredients can make for an incredible dish! This looks so pretty and I bet it tastes wonderful! Thanks Malinda! It’s soooooo good! Heck yea that’s awesome! Christmas Mexican fusion!